Sometimes in the English language, you may come across words that have been contracted. We usually contract (shorten) words in English to join two words together . An apostrophe (‘) is normally placed where the missing letter, or letters, would be if the two words were complete. Contractions are usually included in informal writing rather than formal writing, and more often than not in speech. Some contractions may cause confusion to some people learning English as a second language, as they can have more than one meaning. Positive contractions are usually words that denote a positive meaning in one way or another. 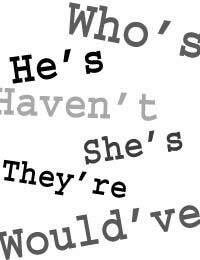 The contraction for the word ‘is’ and the word ‘has’ (s) are used with nouns, pronouns, names and question words. So, instead of “Richard is happy”, it could be “Richard’s happy”. Instead of “there is a cat”, you could contract it to “there’s a cat”. Negative contractions are usually ended with the word ‘not’. Also, while using the verb ‘to be’, it is possible to create two other negative forms – We’re not or we aren’t. As informal contractions are almost slang words, they are not normally used in writing. You can use them when writing short notes or letters to people you are familiar with, but it is not advisable to use them in any other forms of writing. You may find informal contractions in scripts, comic books and personal letters, but you would never find them in a formal letter to an employer, or employee; nor would you find them in essays or school writing. The same goes for speech; you wouldn’t use informal contractions in a job interview or when speaking publically. However, you would probably use them when chatting to friends and family. With informal contractions, an apostrophe is hardly ever used. There are lots of contractions in the English language. Some are more common than others, but they are widely used in speech, and in writing. They are an important part of being truly fluent in English, whether you are learning as a second language, or you are a native speaker.